Americans generally support military action against Iraqi President Saddam Hussein, and while most think war is inevitable, there is no rush to begin it, according to a CBS News/New York Times Poll released Sunday. The public overwhelmingly wants to get the United Nations' weapons inspectors back into Iraq and allied support before taking any military action. Americans also want a congressional vote before acting - and think members of Congress should be asking more questions about the implications of war with Iraq. Americans are concerned about the wider implications of war with Iraq. They believe such a war will result in a long and costly military involvement; they believe it will lead to a wider war in the Middle East with other Arab nations and Israel; and that it could further undermine the U.S. economy. Americans are also cool to the doctrine of pre-emption. They believe countries should not be able to attack each other unless attacked first - and less than half of Americans think the U.S., in particular, has the right to make pre-emptive strikes against nations it thinks may attack in the future. More people now than just two weeks ago favor giving the United Nations more time to get weapons inspectors back into Iraq. Support for getting U.S. allies on board before any military action has remained constant. Asked whether Iraq presents such a clear danger that the U.S. needs to act now, even without allied backing, or whether the U.S. needs to wait for such backing, Americans expressed the desire to wait. Americans also overwhelmingly believe President George W. Bush should get the approval of Congress before taking any military action - a feeling that is unchanged from two weeks ago. Today, 70% say he should get approval. Two weeks ago 65% said he should and 31% said Bush make the decision on military action for himself. SHOULD BUSH GET CONGRESSIONAL APPROVAL ON IRAQ? And before giving that approval, Congress should ask more questions, according to most Americans. 51% say Congress has not asked enough; an increase from the number who said so in September. Just 17% say Congress has asked the right amount already and 20% say it has asked too many questions. HAS CONGRESS ASKED ENOUGH QUESTIONS? Americans continue to believe that war is inevitable, but slightly fewer now believe the situation may be resolved with fighting. Today, 70% believe the military will end up fighting against Iraq, while 78% said this in September. WILL U.S. END UP FIGHTING IN IRAQ? A majority of Americans continues to support the idea of removing Saddam Hussein from power -- but support drops dramatically when Americans consider the costs in potential loss of life, and Americans are very concerned about U.S. action leading to wider war in the Mid-east. Over two-thirds, 67%, approve of using military action to remove Saddam Hussein. This figure is roughly the same as it was this summer, and last winter. In August, 66% approved of such action; in February, 74% approved. However, 54% would support removal of Hussein if the action resulted in substantial U.S. military casualties, and 53% believe removing Hussein is worth the potential cost in American life. Even fewer Americans, 49%, would support action if it resulted in substantial Iraqi civilian casualties or if military action in Iraq would result in U.S. involvement in a war that lasted months or years. This drop-off was also seen in previous polls. Some of the hesitancy about going to war may stem from Americans' lack of optimism about the consequences - for both the U.S. and for the region. Just over half of all Americans, 51%, believe any military action in Iraq would result in a long and costly involvement, and 43% think the effort would be quick and successful. And Americans think a war with Iraq will lead to wider war in the region. Asked if a U.S. - Iraq war could lead to a broader conflict involving other countries in the Middle East, including other Arab nations and Israel, 60% said that it was likely it would. WOULD U.S.-IRAQ CONFLICT LEAD TO LARGER MID-EAST WAR? Moreover, Americans are unsure about the payoff from a conflict with Iraq: most do not think that action against Iraq would reduce the threat of terrorism against the U.S. If anything, war might increase that threat - half say this, a figure up slightly from September. Only 16% say war would reduce the threat to the U.S.
Additionally, Americans are showing reservations about the impact of war on the U.S. economy. More that believe war will make the economy worse than believe war will improve it or have no impact. However, Americans do believe that the threat from Saddam Hussein's Iraq has grown in the nearly two years since Bush took office. 56% say Iraq is a greater threat to the U.S. today than it was two years ago; 36% say it represents the same level of threat. A bare 4% say it is less of a threat. Americans do not support the general doctrine of pre-emption - that is, the idea that one country can launch an attack on another if it thinks it might be attacked first. Only 33% believe that one country should be able to attack another because it thinks that country may attack first. A majority, 56%, believes one country should not be able to attack any other unless it is actually attacked first. Americans do not give themselves the right of pre-emption, either (though they are slightly more accepting of the idea when it involves the U.S. particularly). When asked if the United States should act in this pre-emptive fashion, the idea still does not find majority support. 44% believe the U.S. should not attack another country unless the U.S. is attacked first. Only 43% say the U.S. should be able to take a pre-emptive strike against another country that it thinks may attack the U.S. first. Despite his statements over the weekend about the pressing need to disarm Saddam Hussein, Americans believe Bush is more interested in removing Saddam Hussein than in removing the weapons of mass destruction from Iraq. Americans also believe Bush is being somewhat influenced by his father's experience with Hussein. 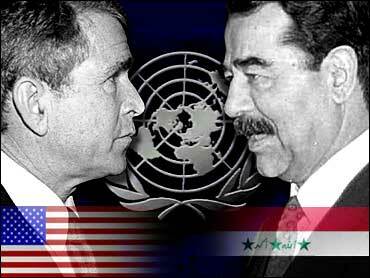 However, most see Bush as wanting to work with the United Nations and NOT moving too quickly towards war. BUSH: MORE INTERESTED IN REMOVING HUSSEIN OR WEAPONS? In deciding what to do about Iraq now, most Americans think Bush is being influenced by his father's experience fighting Saddam Hussein, but most say the amount of that influence is about right. 29% say Bush is too influenced by his father's experience; only 6% believe George W. Bush is influenced too little. Those who believe Bush is too influenced by his father's experience with Hussein are overwhelmingly more likely to think that George W. is more interested in removing Saddam than in removing weapons: 78% of them think so. But there is a split among people who think George W. is taking the right amount of influence from his father's experience: 41% say he is more interested in removing Hussein; 39% say removing weapons. Most Americans do approve of Bush's current pace toward a possible war. 62% think the President is moving at about the right speed, or even not quickly enough, toward war. However about one-third maintain he is moving too quickly. A majority, 57%, also believes George W. Bush DOES want the U.S. to work with the United Nations, though more than a third (38%) remain unconvinced. Bush has made strides in showing his willingness to work with the U.N. since September, when under half of Americans (49%) believed he really wanted to work with the United Nations. DOES BUSH WANT U.S. TO WORK WITH THE U.N.? However, more Americans believe the Bush administration is generally too quick to use force than to try diplomatic solutions in its dealings with foreign countries. 50% say the Bush administration is too quick to get military forces involved, and 40% say the Administration tries hard enough to reach diplomatic solutions first. And most Americans still do not believe the Bush administration has a clear plan for the campaign against terrorism; they say it is simply reacting to events. 54% say the administration is simply reacting to events as they occur, while 41% say the administration has a clear plan. These feelings are virtually unchanged from September. But Americans do think the Administration has a clear plan for taking military action against Iraq: 52% believe it does. On the Congressional front, a majority of Americans feel Bush has tried to compromise with Democrats in Congress in order to get things done. 53% say that the President has done so. Just slightly fewer, 50%, believe the Democrats have really tried to work with Bush to get things done. And although Americans think Congress has not been asking enough questions, they do believe it is okay to criticize the President on both military and domestic issues. 64% say it is okay to publicly criticize him on military policy; slightly more, 72%, say it is okay to criticize on domestic policy. Americans continue to pay attention to news about the possible war. 58% say they have heard or read a lot about it, and another 33% have heard something about it. These figures are roughly the same as two weeks ago.